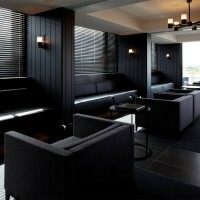 Katon Redgen Mathieson have designed the interiors of the Burbury Hotel in Canberra, Australia. Conceived for the corporate market, the hotel rooms feature dark fabric wall panels, crisp white plantation shutters, and a custom designed carpet. A timber veneer clad box separates the bedroom from the open plan bathroom area and accommodates a built in desk, wardrobes and a mini bar. 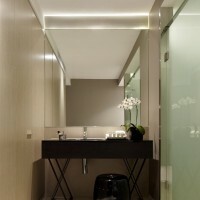 The vanity is designed as a freestanding furniture element, whilst the shower and toilet are screened by a wall of translucent glass. 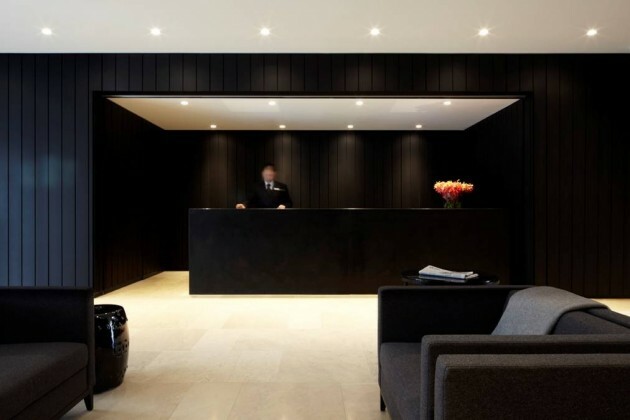 The hotel public areas incorporate dark timber wall panelling and Gohera limestone floors. 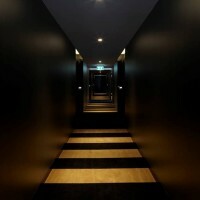 The hotel corridors continue the colour palette of the guest rooms witha graphic black and tan striped carpet. The Burbury Terrace on the upper level of the hotel is designed as a multi purpose venue for functions, the hotel breakfast service and as a lounge for hotel guests. Visit the Katon Redgen Mathieson website – here.